I love J.Crew Factory, probably too much for my own good, so I decided to choose one of my favorite pieces from their and showcase how you could wear it 3 different ways. 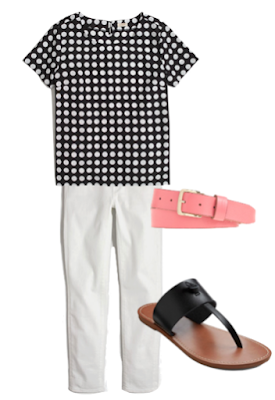 I chose this adorable black and white polka dot shirt that can be dressed up or dressed down. Keep reading to see how I styled it. I hope you guys like these outfits! On Wednesday, I will be showing you all what I wore over Memorial Day weekend. How you would wear this top?